The flooding that had been forecast for the Willamette River over the last few days did not materialize. But there’s still a lot of water running down the river past Albany. Shouldn’t we try to store some of that water? The Corps of Engineers operates 13 dams in the Willamette drainage, most of them in the foothills of the Cascades. It had plans for at least a couple more in eastern Linn County, at Cascadia and Holly, but they were never built and the plans were abandoned decades ago. There was a good deal of local opposition to those additional dams, and probably they were not all that practical or they would have been built after Green Peter and Foster were finished in the 1960s, well before dam building became frowned upon for the effects dams have on migratory fish. Now the situation has changed. Though their models and projections are open to question and doubt, scientists say snowfall will gradually decrease over the next decades and winter rainfall is likely to increase. If we’re worried about having enough water in the summer — for people, for farming, for industry, and for fish too — we should be planning to store more of that wintertime rain. 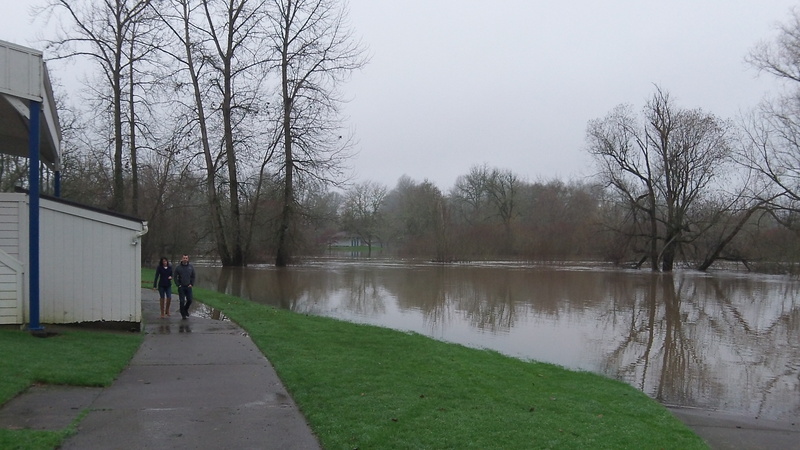 Two people walk past an inundated part of Monteith Riverpark on Dec. 23. Well of course they aren’t interested in planning ahead. For the most part Democrats only seem to be interested in projects that can be completed and show results in the short term. So they are still around to say “Look what we did”. Their second, or possibly most common trait is that they’ve never met a tax they didn’t like no matter how it hurts the economy. When I look around, I would suggest that exactly because of that decade+ potential, it’s worth the effort.